Why are young girls and women in this country being put at risk of cervical cancer? Imagine a vaccine existed that could dramatically reduce your daughter’s chances of getting cervical cancer later in life. The earlier she gets this vaccine, the more effective it will be. Imagine it was also available – for free – at her local school. Would you protect your child in this way, or not? For many parents, it could depend on the risks involved, if any. The good news is that such a vaccine is indeed available for free in New Zealand. Its safety record appears to be as good as any vaccine can be. (See below.) Your daughter can get it either through schools that consent to be part of what is called the HPV Vaccination Programme, or free from the family GP until she is 18. The vaccine is called Gardasil. The bad news is that the take-up rate is surprisingly low. 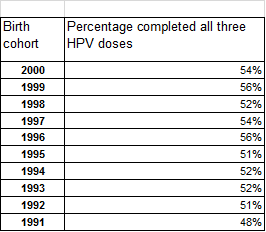 Just over 50 % of New Zealand girls in the age group at risk receive the full course of three shots – and that figure has hardly budged since the HPV vaccination programme began in 2008 (See chart below.) Unfortunately, the take-up rate in New Zealand is far, far lower than the same prevention programme in Australia. In Australia, the HPV programme has also been extended to boys, in order to stem the spread of the HPV virus. From February 2013, males and females [in Australia] aged 12-13 years will receive the HPV vaccine at school. Males aged 14-15 years will also receive the vaccine as part of a catch-up program until the end of the 2014 school year. Why then, are so many New Zealand parents failing to take advantage of a free programme known to protect their children for life, from a deadly form of cancer? Parents, school principals, boards of trustees, and health professionals all have to share some responsibility. The outcome is that women are dying, unnecessarily. The total cost of the programme across the whole country, including the cost of the vaccine, vaccine delivery costs, health promotion, district health board school-based programme costs and local programme costs, was estimated in 2012 at $8,705,448.20 a year, each year, across all DHBs. As with any other vaccine, the aim is prevention. The National Cervical Screening Programme is intended to detect low-grade changes in the cervix, before they turn into full blown cervical cancer. These low grade changes are always associated with HPV infection. That’s where the vaccine comes in. It prevents anyone developing the low grade changes that go onto become cervical cancer – because they will never had the cervical infection in the first place. Right. So, here we have a known-to-be effective prevention programme for the nation’s young female population against a deadly disease that kills about 80 women a year, and where about 200 women a year are diagnosed with invasive cancer of the cervix, and thousands of women suffer the anxiety related to an abnormal cervical smear. Yet even so, the government spends only $8.7 million a year on the vaccination programme. That’s less than the almost $9.3 million that it spends on the next, colposcopy stage of detection – and is about a fifth annually, of what the government plans to spend this year on the America’s Cup challenge. Before examining other explanations for the low level of participation by New Zealanders in this programme, some background. The requisite three doses of the Gardasil vaccine can be taken at any point in the life of a girl or young woman, but the research evidence indicates the earlier the vaccination – ie, before the commencement of sexual activity, which is the common mode of transmission of the HPV virus strains and related genital warts – the better. Since the vaccination programme began here the take-up rates in New Zealand have never risen above 56%, overall. These figures stand in stark contrast to the outreach of the same campaign in Australia. 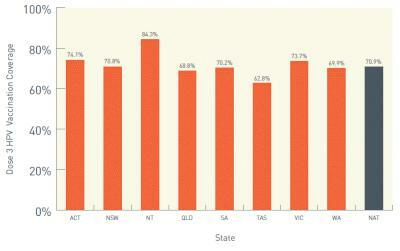 Even though the relevant Australian figures are not strictly comparable – they measure the state and national outreach among 15 year old girls – the Australians are clearly doing much better in reaching a nationwide figure of nearly 71% than we are (54%, above) even though they face exactly the same social fears and prejudices about the HPV vaccination programme. Also, as mentioned, Australia is now vaccinating boys as well. We aren’t vaccinating boys currently, even though nearly half the population of New Zealand girls are at risk from being infected by them, by dint of going unvaccinated, and unprotected. Around 15-20 of these are known to be oncogenic (cancer promoting) and over 99% of all cervical cancers are caused by high risk HPV types. The most common oncogenic types are types 16 and 18 which cause around 70% of cervical cancers. HPV types 6 and 11 are associated with around 90% of external anogenital warts. HPV infects the deeper layers of the skin and internal lining of organs. Infections in the cervix are often asymptomatic and over 90% resolve spontaneously within 2 years. Sometimes infection persists and over time can cause cervical cell changes that can eventually lead to cancer. Once integrated into the DNA of the host cell, HPV infection cannot be treated – however precancerous changes can be detected by screening (cervical screening) and removed. Gardasil protects girls and women against the main viruses responsible : 6, 11, 16 and 18. 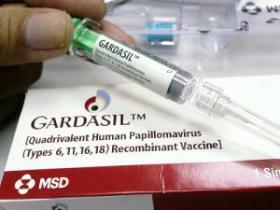 Although it mimics the outside of the virus, Gardasil cannot replicate the virus, and cannot cause infection. The incidence of negative extreme reactions to the vaccine are rare, and no higher than with any other vaccine. A 2009 study on adverse reactions to the HPV vaccination programme in New Zealand is available here. 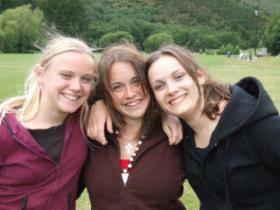 The death of 18 year old Upper Hutt schoolgirl Jasmine Renata in late September 2009 – six months after receipt of her third Gardasil dose – created a flurry of controversy about the safety of the HPV vaccine, especially in its possible relation to the formation of blood clots. In 2012 the family of Upper Hutt teenager Jasmine Nicole Renata told a coroner’s inquest they were convinced the Gardasil vaccine was responsible for the 18-year-old’s death. Miss Renata was found dead in her bed at home on September 22, 2009. However, medical experts told the inquest that the symptoms the teen suffered suggested a congenital heart problem. Yet early this year, a large study carried out in Denmark and Sweden between October 2006 and December 2010 involving adolescent girls (and nearly 700,000 doses of the vaccine) found Gardasil to have an excellent safety profile. Our own Immunisation Advisory Centre website summarised the findings in February here. In July 2014, the Australian media updated the findings on Gardasil from this large Danish study, part of an even wider study of health among female adolescents. New analysis of more than 500,000 women who have received the vaccine did not find an increased risk of clots. The study included more than 1.6 million Danish girls and women aged between 10 and 44 years from 2006 to 2013. Of those, 500,345 or 30 per cent had been given Gardasil, which is free to teenagers in Australia and licensed for use in 120 countries. While there were 4,375 cases of VTE [venous thrombo-embolism] further analysis of 889 women who were administered Gardasil during the study did not find a link between clots and the drug. The observations were based on their health in the 42 days immediately following the vaccination, which is considered the main risk period. The study’s authors also factored in whether the women used oral contraceptives and blood-thinning anticoagulants…’This study provides even more evidence that HPV vaccination is very safe. Early American studies, which were based on reports coming in from people who were vaccinated, had suggested that there may be an increased chance of blood clots occurring after HPV vaccination,’ Dr Julia Brotherton, the medical director of Australia’s National HPV Vaccination Program Register, said. ‘This large study based on five years of vaccination in the Danish population very elegantly analyses this issue and robustly refutes the presence of any association between HPV vaccination and blood clots. Overall the patterns of events observed are typical of post immunisation symptoms and raise no safety issues of concern. Although the fainting episodes appear to be more frequent for the HPV than for other vaccines in the CARM database they are not unexpected in the context of a mass immunisation programme such as the HPV programme focusing on adolescents. In sum, parental fears about the safety of the vaccine seem totally unjustified by the research evidence. (b)	the reluctance among some parents, educators and physicians to discuss or implement anything to do with the sexual health of adolescent girls. Denial and prejudice need to be overcome before the HPV programme is more widely available, in schools and from GPs. The cold statistics tell a somewhat depressing story. The relevant table is here. This finding was reported in the 2012 evaluation of the programme conducted by the Ministry of Health, and available here. The vaccine is not addressing an immediately life-threatening disease and given the low levels of awareness of the prevalence of HPV and the link to cervical cancer, there is no real urgency or perceived need for parents to prioritise an information evening on the vaccine. Seeking access to schools requires sensitive discussions and negotiations with the Board of Trustees (who make the ultimate decision on access), and the principal (who oversees the day-to-day management of the schools). Feedback from school vaccinators and parents highlight that it only took one very vocal and anti-vaccine Board of Trustee member to result in a school declining to participate. Centuries of evidence support the efficacy of vaccination, beginning as far back as 1793 when Edward Jenner inoculated a servant’s boy against smallpox with cowpox virus. Vaccination has been described by the World Health Organisation as the single greatest achievement in health, short of clean drinking water. Scares about vaccine effectiveness and safety have been around since Jenner, but they’ve all fallen in the face of evidence. Right now, with sexually transmitted diseases (STDs) on the increase, we shouldn’t be gambling with the health of New Zealand girls. Especially not on the basis of (a) ungrounded fears about vaccines, (b) parental embarrassment (c) a wilful denial of adolescent sexuality, and (d) a misguided faith in a message of abstinence.